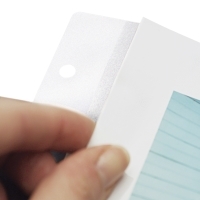 Affix a clear adhesive hinge strip to your document or artwork, and it's instantly ready for a spot in a Pina Zangaro screwpost portfolio or 3-ring binder. 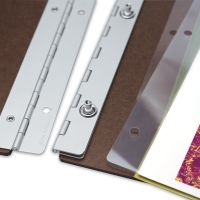 Simply peel back the release liner to expose the archival adhesive, adhere your document to the adhesive edge, and place the sheet into your portfolio book or binder. Pina's clear hinge strips are made of archival grade DuPont polyester. They will not damage your work over time, and will not tear. 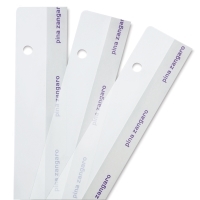 The strips are available in four lengths. The 8½" strip has three holes, the 11" strip has five holes, and the 14" and 17" strips have four holes. All are designed to fit Pina Zangaro screwpost presentation books.